Please consider using the support link below to seek assistance, instead of refunding products. 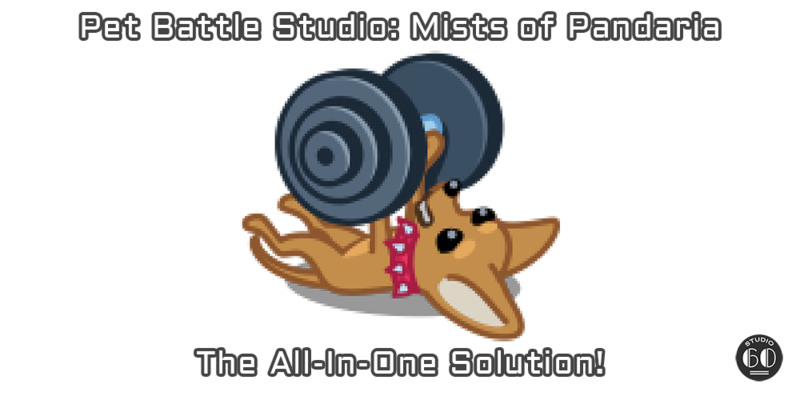 This is the best solution for all your pet battle-related needs in Pandaria. This profile pack just has it all. It travels on its own from spot to spot, uses the Safari Hat or Pet Treats for faster leveling, levels all your pets as far as the leveling profiles take them, captures all listed, wild pets up to rare quality, unlocks and completes all daily quests and you only have to press the start button. - Relative leveling takes pets of the same level and makes them fight enemies of the same level. This product covers pets from level 23 to level 25 in relative leveling mode. - Boosted leveling puts one weak pet in a team with two pets on level 25. This product covers pets from level 5 to level 25 in boosted leveling mode. All of these profiles work hand in hand with the free Studio Companion plugin. This means you have more options than ever to get exactly the pets you want. Select specific profiles or just hit auto and let the bot travel around and capture pets for you. Want all quests done? Again, hit Auto and see the magic happen. Tactics for tamers are variable and are constantly improved and extended. The free Tactic Editor is available for everyone and if we are missing a tactic, create it yourself or ask for it on the support tread and we or one of the other users will try to come up with a tactic that suits your needs. 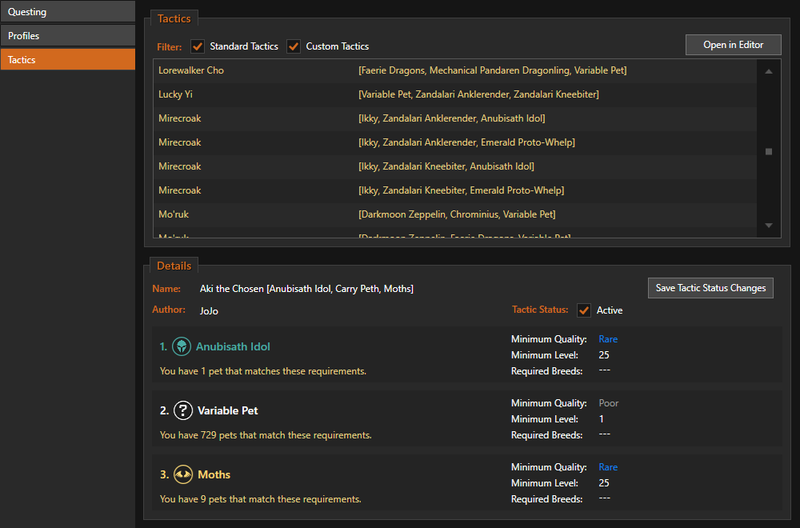 If you want to check out the complete list of tactics currently available for a specific tamer, then open the free Studio Companion plugin and check out the tactics under "Pet Battles > Questing > Tactics". We would love to put a list up in here, but new tactics are added so regularly, it is just not possible to maintain a list in here. 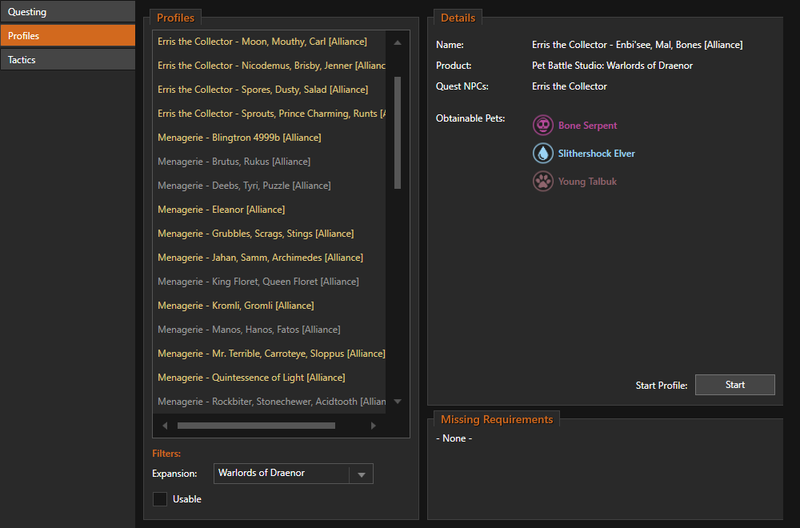 The "Studio Planner" is a part of the Studio Companion and enables you to chain run selected profiles. It is a solid foundation for even more awesome things to come. You just configure the daily quests you want to run. Then you can start the run through the "Start Run" button as seen on the screen or through a profile which will be generated by the Studio Companion. Its location is displayed on the HBRelog tab. You can easily stop the run at any time. 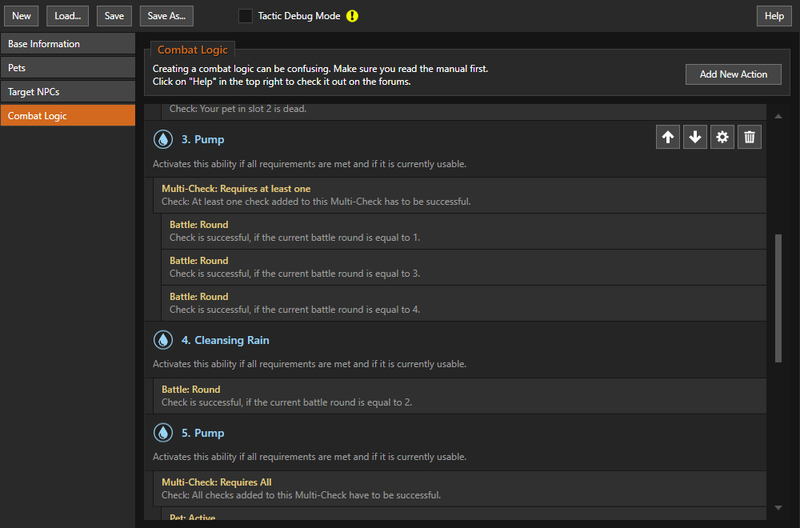 The plugin will figure out which raids it should still go to when you continue. It crashes after every single quest or capture. Studio60 puts out some great stuff, but I wouldn't recommend. Automates the Celestial Tournament. 'Nuff said. Absolute god send. The amount of effort put into keeping it updated and working even after the Legion pre-patch is amazing. One of the best purchases I've ever made. Studio 60 delivers again so damn nice profiles just works. great work love it !!! !